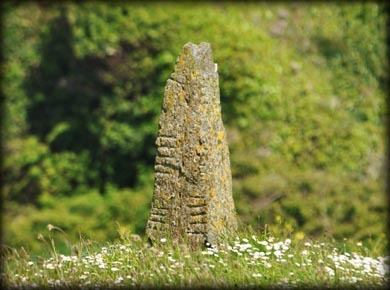 These two ogham stones stand on top of an artificial mound in a small section of the Geological Park at Bunmahon. They were moved to here from the promontory fort at Knockmahon; 600 metres to the east. 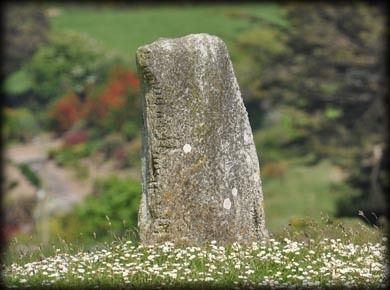 The stone pictured left stands 1.2 metres high and bears a well preserved inscription which reads SENAQ̣ MAQI MUCOI ENA. The second stone stands at 0.87 metres in height and bears the inscription VEDILIMETO MAQI TOQITAQ. It is nice that the stones are so easily accessible, but I worry that they may be too exposed to the elements in there present location. Situated: From Tramore head west along the coastal drive (R675). As you enter Bunmahon you will see a section of the Geopark on your left. There is a small parking area immediately after the Park. Discovery Map 82: X 4365 9889. Last visit May 2016.